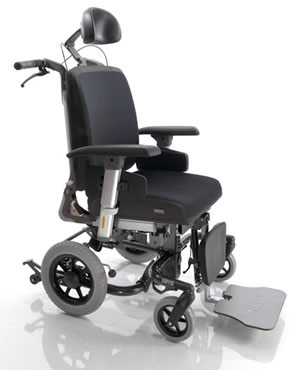 The Ibis Pro Comfort wheelchair with the Sedeo Pro Seating – when comfort can make a difference. The Ibis pro has the award winning Sedeo Pro ergonomic seating. The Ibis comes with a 30 degree tilt in space adjustment as standard; this chair ensures optimal variation in seating posture. Sunrise Medical have made this chair so its modular design is highly adjustable therefore allowing the chair to be customised to the needs of the user to ensure a perfect fit. For example it comes standard with a manual elevating central legrest but you have the option of swing away legrests, with all its additional options it can also be adjusted to meet changes in the user’s physical condition. There are many options available to this chair including a reclining backrest, swing away legrests, different seat cushion choices and many many more. If you have any questions regarding the Ibis Pro Comfort or would like to book an appointment to be assessed please do not hesitate to contact us on 0330 0581 008 (Local call rates apply) or FREE PHONE 0800 626 829 or complete the form on this page and we will get back to you.